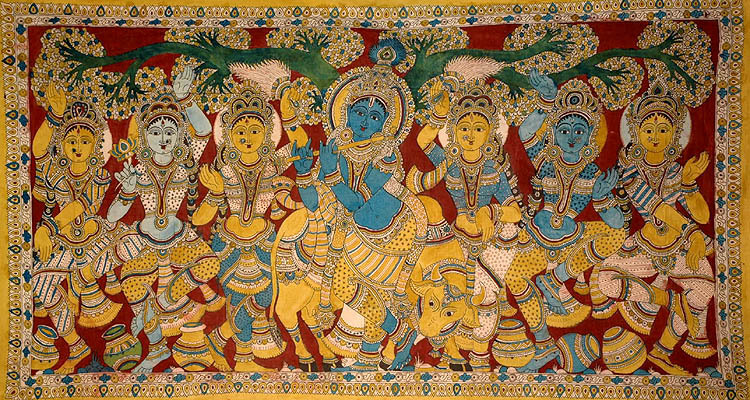 In yesterdays post we listed the 64 Arts and Sciences that Krsna and Balarama learned from their spiritual master, today we list the The Sixty-four Activities in Fine Arts and Crafts, learned by Srimati Radharani and the gopis, as found in the Brahma-samhita text 37. 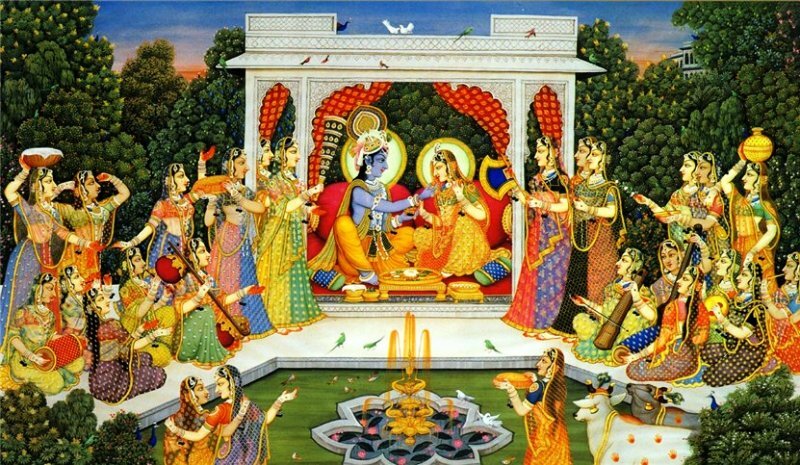 I worship Govinda, the primeval Lord, residing in His own realm, Goloka, with Rādhā, resembling His own spiritual figure, the embodiment of the ecstatic potency possessed of the sixty-four artistic activities, in the company of Her confidantes [sakhīs], embodiments of the extensions of Her bodily form, permeated and vitalized by His ever-blissful spiritual rasa. 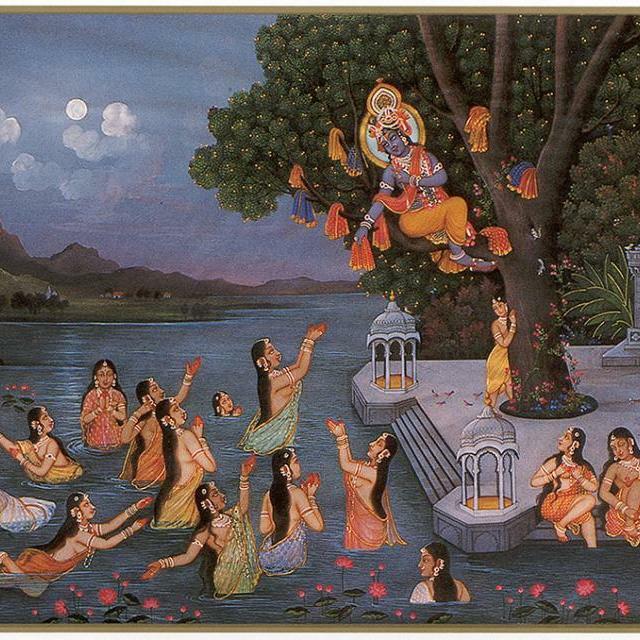 …Early in the morning, the gopīs used to go to the bank of the Yamunā to take bath. 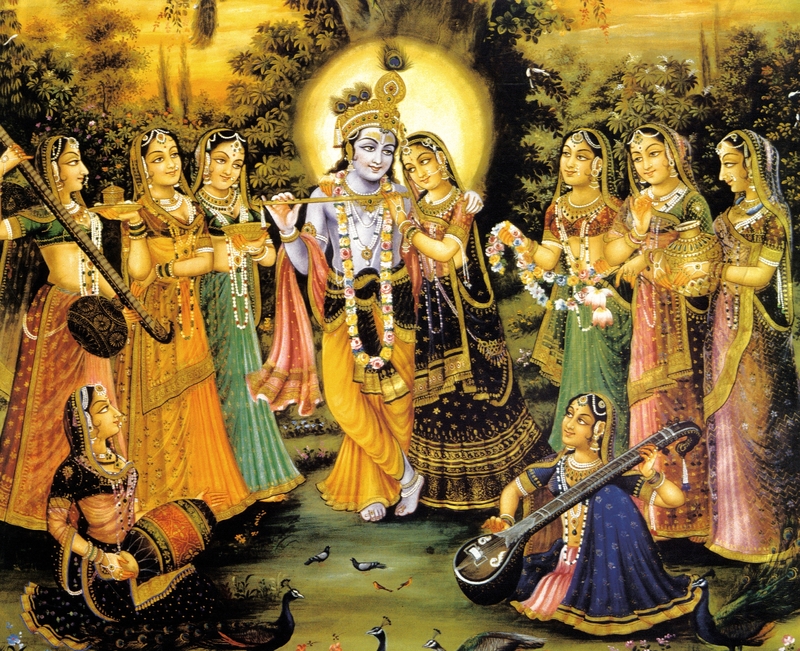 They would assemble together, capturing each other’s hands, and loudly sing of the wonderful pastimes of Kṛṣṇa. It is an old system among Indian girls and women that when they take bath in the river they place their garments on the bank and dip into the water completely naked. The portion of the river where the girls and women take bath was strictly prohibited to any male member, and this is still the system. 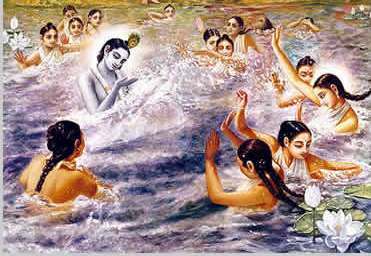 The Supreme Personality of Godhead, knowing the minds of the unmarried young gopīs, benedicted them with their desired objective. 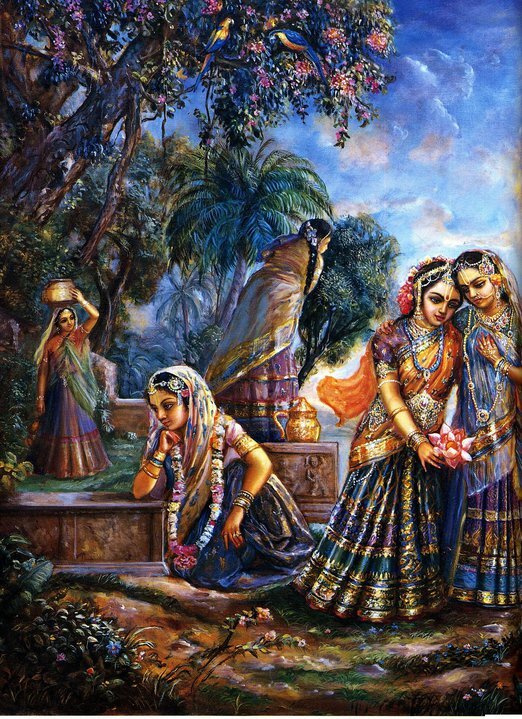 They had prayed for Kṛṣṇa to become their husband, and Kṛṣṇa wanted to fulfill their desires. 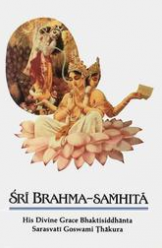 Persons who are constantly engaged in the transcendental meditation of seeing Kṛṣṇa, internally and externally, by thinking of Him playing the flute and entering the Vṛndāvana forest, have really attained the perfection of samādhi. Samādhi (trance) means absorption of all the activities of the senses on a particular object, and the gopīs indicate that the pastimes of Kṛṣṇa are the perfection of all meditation and samādhi. It is also confirmed in the Bhagavad-gītā that anyone who is always absorbed in the thought of Kṛṣṇa is the topmost of all yogīs. Kṛṣṇa was very pleased with the atmosphere of the forest where flowers bloomed and bees and drones hummed very jubilantly. 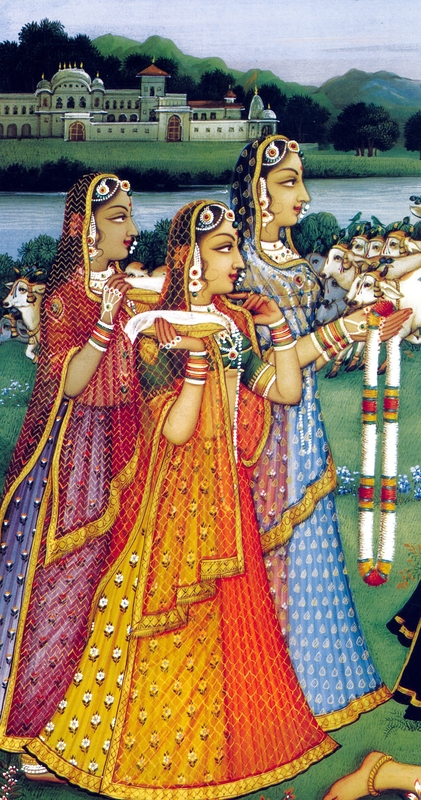 While the birds, trees and branches were all looking very happy, Kṛṣṇa, tending the cows, accompanied by Śrī Balarāma and the cowherd boys, began to vibrate His transcendental flute. After hearing the vibration of the flute of Kṛṣṇa, the gopīs in Vṛndāvana remembered Him and began to talk amongst themselves about how nicely Kṛṣṇa was playing His flute. When the gopīs were describing the sweet vibration of Kṛṣṇa’s flute, they also remembered their pastimes with Him; thus their minds became disturbed, and they were unable to describe completely the beautiful vibrations. While discussing the transcendental vibration, they remembered also how Kṛṣṇa dressed, decorated with a peacock feather on His head, just like a dancing actor, and with blue flowers pushed over His ear. His garment glowed yellow-gold, and He was garlanded with a vaijayantī necklace. 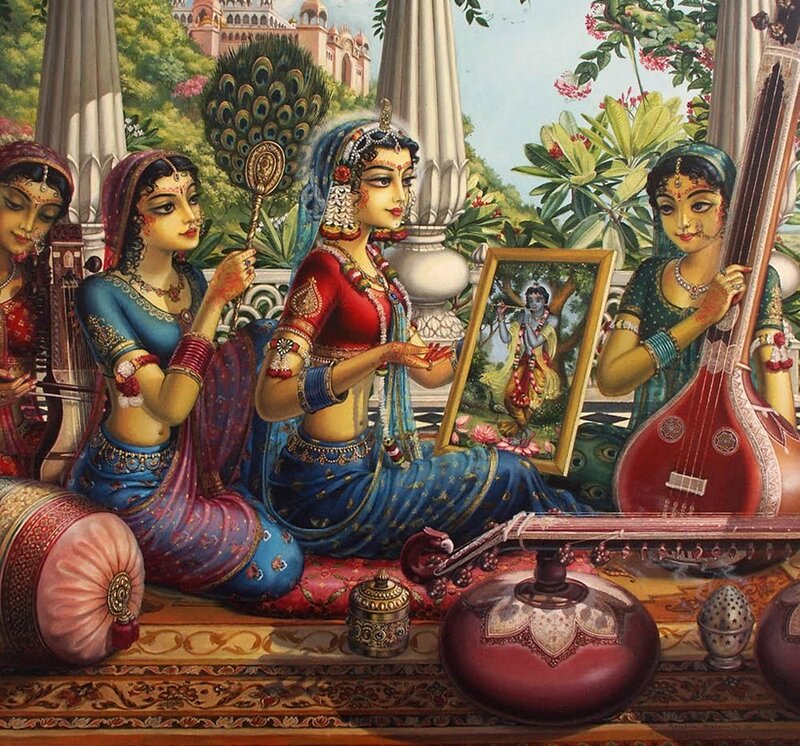 Dressed in such an attractive way, Kṛṣṇa filled up the holes of His flute with the nectar emanating from His lips. So they remembered Him, entering the forest of Vṛndāvana, which is always glorified by the footprints of Kṛṣṇa and His companions.